‘Kensington and Chelsea is an exceptional borough in many ways, and the way that property prices have rocketed has little to do with their intrinsic value, and more to do with a global poker game for the super-rich; at some point this game will fold and the players will move on. ‘The Council Tax system as it currently functions is anachronistic, and works as yet another effective subsidy to landlords. This is in addition to capital gains tax relief, lack of property tax, and the ease of obtaining buy to let mortgages at preferential rates based on interest only. In most other European countries the owner pays the tax, not the beleaguered rental occupier; there is a logic to this as it is the owner who profits long-term. ‘The system currently being considered by Ed Balls would have unintended consequences in Kensington and Chelsea, and we have many questions and concerns that we have already made public. We have 12,000 homes worth over £2m in the borough, and 7,000 of those have been in the same ownership since 1999; some of these are families, retired people, or others on fixed incomes. The prospect of a Mansion Tax as currently envisaged would drive out these families and long-term residents, whether owners or renters, who tell us ‘it’s my borough too’. ‘Our counter-proposal would consider a revaluation of property, and setting more Council Tax bands, so some would pay less, and others more. 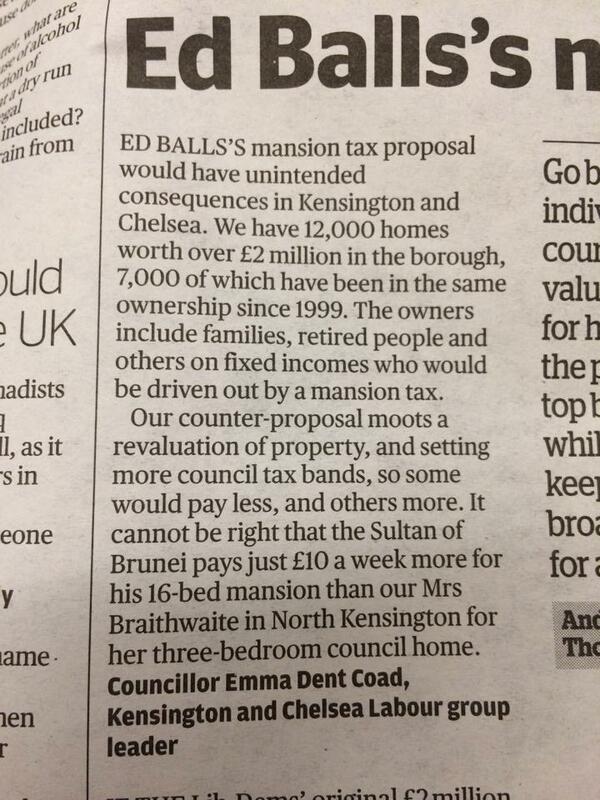 We are working on the detail of this, while we wait for more detail on how a proposed Mansion Tax would work.